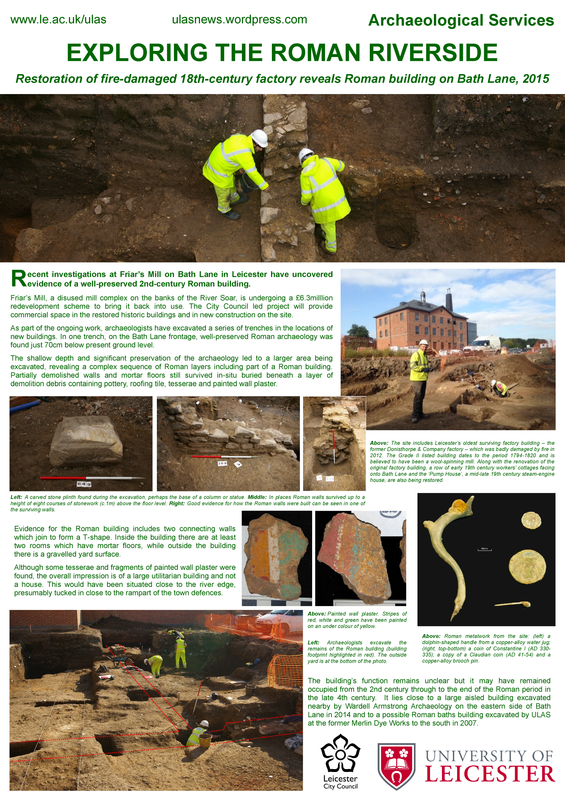 This summer (2018) ULAS has been extremely busy on many archaeological projects, here’s a roundup of our key discoveries from three large excavations in Leicester, producing some significant new Roman and medieval discoveries. In one area, on Soar Lane, Roman and medieval buildings were discovered in an open area excavation. Looking east at a medieval building at Soar Lane (Waterside). Note the floorboard impressions in foreground. The medieval building at Soar Lane survived as a plaster floor built over a thin clay ‘slab’, with clay, masonry and mud walls. Possibly reflecting function, the internal space was sub-divided by a partition of stake-holes, enclosing an area of wear corresponding with a deliberate turn in the masonry wall. This may represent a threshold or doorway within the structure. To the west of the plaster floor room, a north/south clay and post pad partition delineates a room, where impressions of the floorboards survived. The building had a series of hearths through its lifetime and the floor underwent successive repairs. Extensive sampling was undertaken to ensure as much information was retained as possible. At this stage in proceedings, dating is a little vague, but it appears that the building went out of use in the post-medieval period. At roughly 5m across and over 9m long, the building probably represents a timber framed property gable end on to Northgates. No clear indication of function has been seen. Looking west across a well preserved Roman building at Soar Lane (Waterside). Not the brick railway abutment at the back of the photo. Separated from the medieval archaeology by a layer of garden soil of medieval and late Roman date were two Roman buildings. Both buildings included solid opus signinum floors, masonry external and mud internal walls, the latter dividing two rooms at the northern end of the building. The western room, measuring c.2.6+m by 4.5m, was the wider of the two. Despite heavy disturbance from the large railway abutments of the Great Central Railway, the building can be traced to the west where evidence for comparative rooms, albeit floorless, appear to continue. Another area under excavation, at All Saints Road, has discovered a medieval cemetery. Over 100 burials have been excavated so far. The initial age range has been wide, with several mass graves containing adults, or children and neonates, or a combination of ages. The burials appear to lie to the north, and in respect of, a building which may be a church, possibly the parish church of St Clement’s or a building associated with the Dominican friary (Blackfriars). A view north across the All Saints excavation. The earliest evidence points to Iron Age activity, in the form of several post-holes and large pits dug into the natural gravels. A series of soil layers overlay the gravels on which were located several hearth-like features, comprising halos of oxidised and reduced earth set within shallow depressions. A Roman building, with a series of rooms, was suggested by lines of in-situ wall plaster, which have helped define the position of the walls. The evidence suggests that construction used rammed earth and clay, possibly also incorporating some timber elements. A large opus signinum floor measured 9m by 6m. Several infant burials were discovered around the edges of the room; one within the wall itself. Lines of stones across the floor suggest division of the interior space and there were a further two rooms and a possible corridor to the west, whilst directly east of the main room, a fourth room contained the remains of a mortar floor, set on a bed of substantial stone rubble. Further to the east, a narrow mud-wall indicated that the building continued beyond the edge of the excavation. The Roman town defences were also identified crossing the site west of the building, including the earth rampart and ditch. The town wall survived as remnants of un-mortared granite foundation about 3m wide, similar to examples found elsewhere. Looking south across a stone boundary wall at the Roman building. Note the opus signinum floor has buckled and collapsed in places. Following the abandonment of the Roman building, a thick layer of soil accumulated across the site. This would have built up both through natural silting and alluviation, as well as periods of cultivation. The medieval archaeology encountered within the site was complex and varied. The most prominent aspect of medieval activity within the proximity of the site was the Dominican friary (Blackfriars), founded in the 13th century and likely to have been sizeable complex of buildings. The present excavation revealed the remains of a stone building on the eastern side of the site. The walls were largely built of local Dane Hills sandstone, supplemented by granite and reused Roman tile. Some of the walls had been robbed out in a later period. The building appears to continue beyond the edge of excavation towards Alexander Street and is also likely to continue east and north towards Jarvis Street. Looking east at stone structures probably associated with the medieval Blackfriars. The third site, on Bath Lane, follows up excavation from an earlier 2007 ULAS project at the former Merlin Works site. That earlier (adjacent) excavation, identified a complex archaeological sequence beginning with late Iron Age workshop production of ceramic ‘flan trays’ linked to the manufacture of coin blanks. During the later first century AD, a substantial masonry building was constructed, featuring structural elements such as apses and hypocaust-heated rooms. Subsequently the western Roman town wall was constructed in such a way as to ‘dog-leg’ around the western apse of the earlier Roman building. Later evidence included the well-preserved south precinct wall of the Blackfriars and substantial medieval and post-medieval industrial activity in the form of tank-like features occupying a yard area and possibly linked to fellmongering. Incredibly well preserved Roman stone walls at Merlin Works, Bath Lane. The new excavation has traced the continuation of the Roman building(s) north into the present site. Whilst heavily disturbed by modern industrial building activity, it would appear that we have identified further elements of the same complex, with indications of opus signinum and tessellated flooring and hypocaust heated room(s) located in one, possibly two wings, extending north and east beyond the site limits. Hence it is possible that this forms part of the same building as that found in recent work by ULAS at Friar’s Mill to the north and an excavation on the opposite side of Bath Lane carried out by Wardell Armstrong. Interestingly, there are no indications of the town wall in the present site area, suggesting that it may instead have traced a course northwest, perhaps in order to bypass our buildings. A curious Roman circular structure at Merlin Works, Bath Lane. Most intriguingly, we have identified the partially robbed remains of a circular masonry structure, c.8m in diameter, the interior of which is backfilled with rubble including opus signinum and box flue tile fragments. It is tempting to speculate that this may represent a tank or possibly a tower base. Might these be elements of a major previously unknown public baths and/or temple complex or mansion?